Copying Quote lines/products can be helpful when a customer would like to re-order the same products or if you need to sell a similar group of products to a different customer. You can copy Quote lines at two stages within the quotation process. Firstly, you can copy Quote lines when you create the Quote record or alternatively you can copy Quote lines after you have created the Quote record. This article will explain how to copy Quote lines in both scenarios. Within the new Quote record screen there is a field called Based On, which can be used to copy Quote lines from existing Quotes and select template Quotes to copy Quote lines from. For more information on template Quotes take a look at our Template Quotes article. To search for the Quote that you wish to copy Quote lines from, click on the Search option within the Based On drop-down. This will open the Copy Lines window, to select the Quote that you wish to copy click on the pencil icon shown in the screenshot below. You will then be able to search for the required Quote using the Quote ID or description, in the example below we searched by Quote ID. Once you have found the required Quote that you wish to copy the Quote lines from, click the 'Select' button. You will then be presented with all the products featured on the selected Quote record. By default all products will be selected however if there are any that are no longer required you can deselect them. 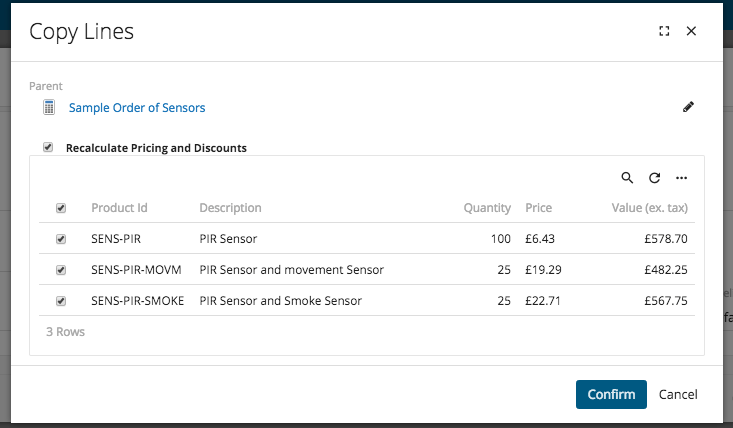 In addition, by default the 'Recalculate Pricing & Discounts' option will be ticked, this is particularly important if you're copying from an old Quote as prices may of changed. Once happy with the selected product click Confirm. You will then be taken back to the New Quote Record screen where you can check other details about the Quote and finally click 'Create' once ready. Your new Quote will then be created with the previously selected products. If you've already created your Quote record but still need to copy Quote lines from another Quote, don't worry as we can still do this via the further options menu. By clicking on the Further Options menu (three dots) in the top right-hand corner you can choose to Copy Lines. 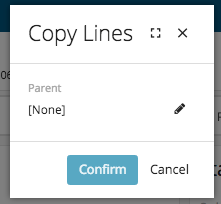 By clicking the Copy Lines option you will be taken to the same Copy Lines window that we saw earlier and can repeat the process via the pencil icon. Finally, you have one final option when trying to copy lines from one Quote to another, this option is very similar to your typical copy and paste functionality. To get started find the Quote that you wish to copy the lines/products from using the global search. Once you have the Quote open, click on the further options menu (three dots) featured in the top right-hand corner of the Products section. Within the drop down menu select the Copy Rows option. You will then be asked to choose the products that you wish to copy. After selecting the required products click the Copy button. Once fully copied a confirmation message will pop-up as shown below. Next you will need to either create or find your new Quote that you wish to paste the copied lines/products to. After you have created or opened your Quote, click on the further options menu again but instead select the Paste Rows option. You will then be asked to confirm the correct products have been copied. If happy with your selection click 'Import Products' and the products will be added to your Quote record.